In short, to feed people. There are millions of people in the world who suffer from malnutrition (1). 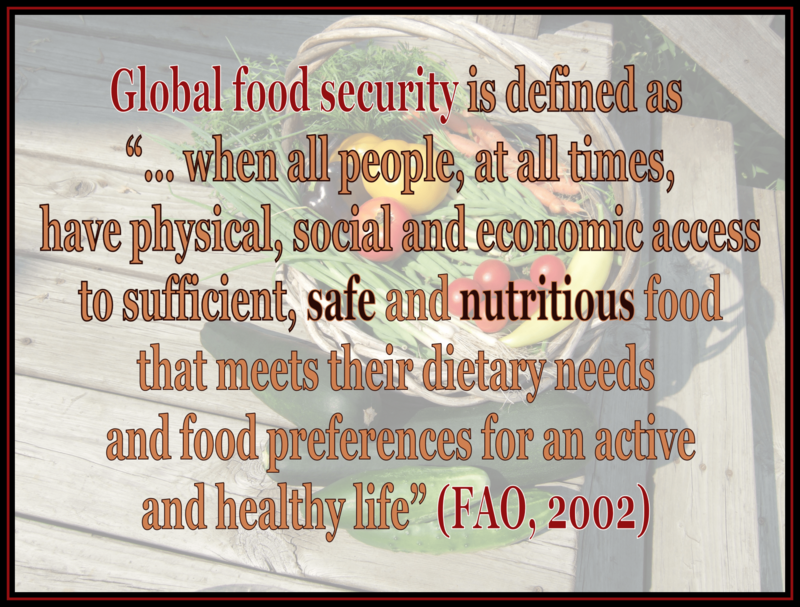 Having access to sufficient, safe and nutritious food is one of the basic requirements for an independent, happy life. Helping achieve this goal for everyone is why I became a plant scientist. Today, a study I did as my dissertation research in collaboration with Sheng Yang He and Beronda Montgomery (and many others!) was published in Nature Communications (2). Here is the Cliff’s notes version. 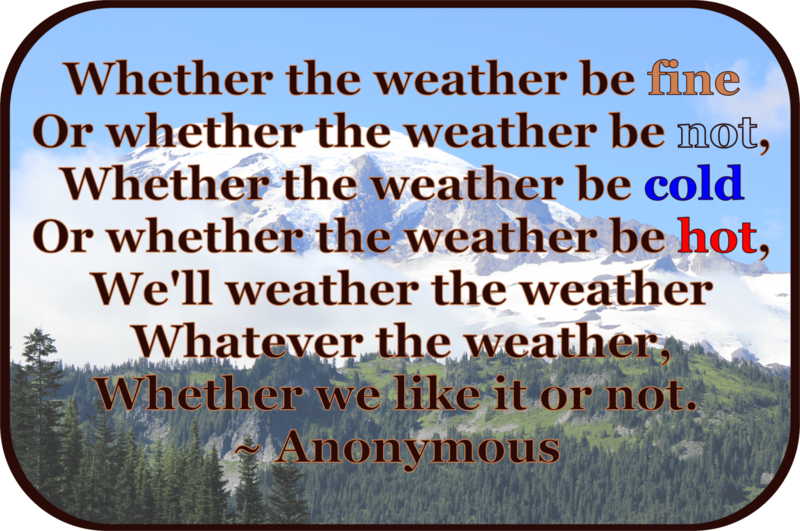 One of the main obstacles to food production is bad weather (3, 4). Whether it is temperature, light or water, too much or too little is bad. Then you have animals, insects and disease to worry about. But why is it that some years are especially bad for disease or insect outbreaks? This happens when the weather conditions are just right for a particular insect or bacteria, and not so great for the plant. Scientists who study plant disease call this relationship between plants, pathogens and the environment the Disease Triangle (5). Basically, to get disease, you need a susceptible host, a virulent pathogen and the right weather conditions (see Figure 1). However, we still have a lot to learn regarding how specific environmental factors, like temperature, affect the interaction between a plant host and a pathogen. Figure 1. Plant disease triangle. 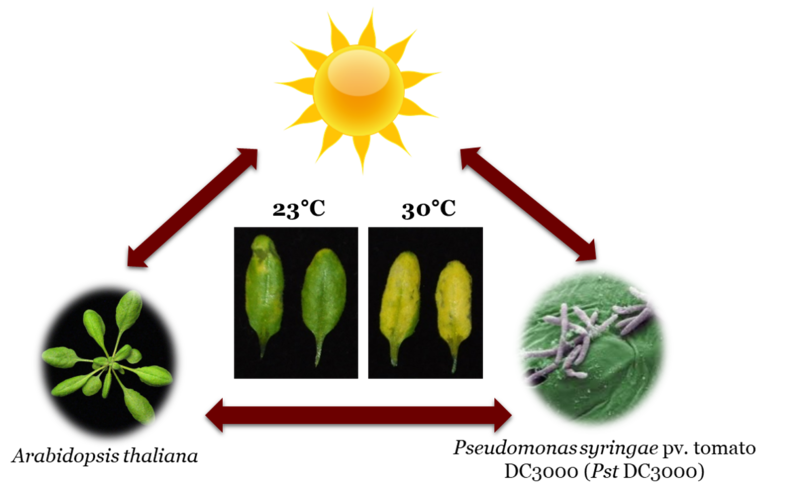 In this triangle, the sun depicts elevated temperature, the plant host is Arabidopsis thaliana (image by Christian Danve M. Castroverde) and the bacterial pathogen is Pseudomonas syringae pv. tomato DC3000 (Pst DC3000; image by James Kremer). The images inside the triangle show disease symptoms of Arabidopsis plants infected with Pst DC3000 at either 23 or 30 degrees Celsius (C). When we started, it was well-known that elevated temperature promotes disease in many plant-pathosystems. The question our study addressed was Why? Was the plant defense system weaker under these conditions, or was the pathogen virulence stronger (see Box 1)? To test these possibilities, we studied the plant host, Arabidopsis thaliana (Arabidopsis), and a bacterial pathogen, Pseudomonas syringae pv. tomato DC3000 (Pst DC3000), at two temperatures, 23°C (73°F) and 30°C (86°F). The higher temperature is considered a moderate stress for Arabidopsis, but a nice growing temperature for Pst DC3000. One of the noticeable responses of the plant to this stress is the orientation of its leaves, which it raises up away from the hot surface of the ground (see Figure 3 below). At “normal” temperatures, Arabidopsis makes a lot of salicylic acid (SA) in response to infection by Pst DC3000 (see Box 1). However, at the high temperature, no SA was produced (see Figure 2a). Loss of SA appears to be a direct effect of temperature on the plant, because we observe it even when the pathogen is not present. Figure 2. Modified from figures 1 and 2 in Nature Communications manuscript. a. Shows the amount of SA in Arabidopsis plants infiltrated with no bacteria (mock) or Pst DC3000 at both temperatures. b. Shows the amount of effector protein movement into plant cells at both temperatures. By measuring the movement of bacterial effector proteins into plant cells (see Box 1), we found that pathogen virulence was enhanced at elevated temperature (see Figure 2b). Of course, since the plant cannot make SA at this temperature, this could simply be a result of a vulnerable host rather than an effect of temperature on the pathogen. To test this, we compared the movement of bacterial effector proteins into plants genetically altered to be SA-deficient. We found that temperature has a greater effect than loss of SA on movement of effector proteins into plant cells. This tells us that heat makes the pathogen stronger AND the host weaker resulting in more disease. If temperature is affecting both the host and the pathogen, which is more important for the disease outcome? We observed that SA-deficient plants have similar levels of bacterial growth at the normal and elevated temperatures, which could mean that loss of SA is the primary cause of enhanced disease. To test this, we sprayed the plants with a chemical that acts like SA and then infected them with Pst DC3000. We found that plants were protected from Pst DC3000 at both temperatures (see Figure 3). This is an exciting finding, as it may provide us with ways to protect crops from disease even when the weather is HOT! Figure 3. 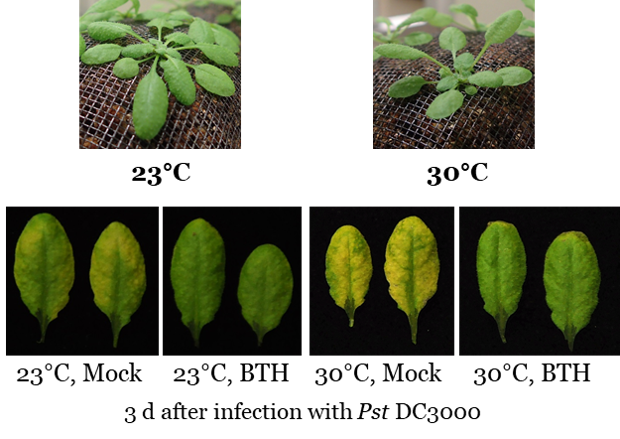 Above Pictures of plants 24 h after moving to chambers at 23 or 30 degrees C. Below Pictures of leaves collected from plants pre-treated with mock or an SA mimic (BTH) and then infected with Pst DC3000 at 23 or 30 degrees C. See publication for more details. Although we learned a lot from our study, there are still more questions to address. For example, why do plants no longer make SA at elevated temperature? We tested many potential reasons, but did not find any of them to be the culprit. Also, we know the pathogen is more virulent at higher temperatures, which could mean that even if we fix the plant’s ability to make SA, the pathogen’s sneaky tricks may be a bigger problem than at lower temperatures. Therefore, it would be good to know what specific factors are important, so we can look for ways to protect plants against them. 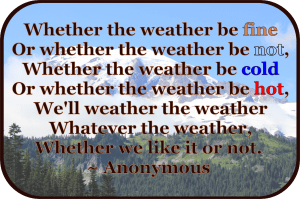 Because organisms and the environment within which they interact are complex, we will need many more studies like this to fully understand how to protect plants when the weather is not so fine. By doing so, we get one step closer to making sure we all have enough food on the table. Note: all images were taken or created by Bethany Huot unless otherwise indicated. FAO I, UNICEF, WFP and WHO (2017) The State of Food Security and Nutrition in the World 2017. 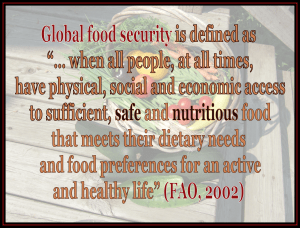 Building Resilience for Peace and Food Security. (FAO, Rome). Huot B, et al. (2017) Dual impact of elevated temperature on plant defence and bacterial virulence in Arabidopsis. Nat. Commun. 8(1):1808. Boyer JS (1982) Plant productivity and environment. Science 218(4571):443-448. Atkinson NJ & Urwin PE (2012) The interaction of plant biotic and abiotic stresses: from genes to the field. Journal of Experimental Botany 63(10):3523-3543. Stevens R (1960) Plant Pathology, An Advanced Treatise, ed Horsfall JG DA (Academic Press, New York, NY USA), Vol 3, pp 357-429. “In this scenario, Bethany Huot, MSU cell and molecular biology graduate program alumna and the study’s lead author, wanted to find out if plants’ defense system was compromised or was pathogens’ virulence enhanced?” Want the answer? Read the full MSU Today article here. The PRL article is here. Also, check out the YouTube video put together by Igor Houwat (PRL Communications Coordinator) with help from Adam Seroka and Danve Castroverde.